Round back of the Yepp YP-55i there is a 'hold' button recessed into the casing, so it can't be unintentionally unlocked/locked. A hold button simply locks out all the controls, and performs such miracles as preventing the YP-55i from springing to life and running down your batteries while it is packed away in bag. 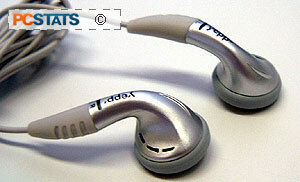 The Yepp YP-55i includes a pair of nice ear bud headphones, in silver. The mini-headphone jack is gold plated, and the ear buds are economically shaped so they rest comfortably when you put them in. Because they are sculpted to fit the curves of an ear canal, they also stay in place much better than some previous Yepp headphones we have tried. The sound quality is on par with what you can expect from this style of headphones, which is more than satisfactory for running around. The cable is also a good length (~1.2m), so you can store the YP-55i in a pocket and still have plenty of headphone cable to spare. When playing back tracks the back lit LCD display shows the track name in the standard scrolling manner. Scroll speed can be adjusted. Under menu settings users can adjust play mode, equalizer preferences, file (format and deleting), and direct play options. The main setting screen gives you control over display properties, back light duration, beeps, LCD contrast, and scroll speed. The equalizer has presets for normal, classical, jazz, rock, dbb, and user defined bass/treble levels. Under play mode, you can change intro length, have one song repeated, all songs repeat, or shuffle things around. If the Yepp YP-55i is left doing nothing, it will automatically shut itself down to save power. To turn it off, hold the play/stop button for about 5 seconds. Yepp Studio Software comes bundled in with the CD full of USB drivers, YP-55i memory formatting, and firmware updating programs. It's not much to get excited about though. The online help files indicate that Yepp Studio software offers music media playback and ripping functionality; it will create play lists like any standard player, but isn't all that intuitive to use. Curiously, the ripping features appeared absent in the copy (v1.0) we installed.... luckily there are plenty of shareware CD rippers out there to choose from.